Creation magazine’s editor, Carl Wieland, is one of many people helped by plastic surgeons to rebuild their lives after devastating road trauma. Here he interviews David Pennington, the first plastic surgeon in the world to successfully reattach a human ear. CW: Dr Pennington, why the word ‘plastic’ in front of ‘surgeon’? DP: Patients frequently think that I am going to use some sort of moulded plastic to fix their faces or whatever. But the word “plastic” has been around a lot longer than the materials we call that today. It comes from the Greek, plastikos, from plassein, meaning to mould or shape something, which is basically what plastic surgeons do to the body. Does your work mostly involve making people look better, or repairing damage? Most of my work is reconstructive surgery, but there is an overlap with the cosmetic. Some people have features they might describe as unfortunate, that they inherited, that cause them psychological upset, where a remoulding process will help them in their life. So that would commonly be called cosmetic surgery. My particular interest is in reconstruction of the female breast after it has been removed in cancer surgery. Using fatty tissue from somewhere else in that person? Yes. I’ve been in the forefront of developing what’s called the ‘TRAM flap’. A portion of lower abdominal tissue is removed, and the tiny blood vessels which ‘feed’ it are carefully detached and are reattached to small blood vessels in the armpit. The tissue is then shaped to form a breast. As well as having a new breast after losing the old one to cancer, the lady has a flatter tummy. I gather much of this sort of microsurgical work was pioneered in Australia in the last few decades? That’s right. One can use such techniques to reattach parts of limbs, noses, scalp, ears and various other parts of the body that have been traumatically severed. Or we can do these things electively. Say we want to reconstruct a part of the body, e.g. a face that has been damaged by cancer surgery. We can take a part of the body from elsewhere, and reattach the blood vessels at its new location, so that the part we are moving stays alive. Please tell us about your ‘world-first’ in reattaching an ear. In 1979, a patient involved in a motor accident came into the Sydney hospital where I was working. Strangely, the only injury he had was that his ear was torn off. I rang the head of the unit and said that I proposed to try to reattach the ear. We were both aware that it had never been done before. He basically said, ‘Go for it.’ Thankfully, it worked. Why hadn’t previous attempts succeeded? The problem in ears is that the blood vessels are so tiny, about 1/50th of an inch (0.5mm) in diameter, and it’s very hard to tell the arteries from the veins, even under the microscope. Now if you join an artery to a vein you’ve got the plumbing wrong, and it won’t work. So we did something new to overcome this problem. We used the vessels that run on the scalp in front of the ear,1 turning them back to act as an arterial conduit. By attaching this artery to a tiny artery in the ear, and letting it bleed, it was easier to distinguish the veins once the vessels were filled with blood. Are ears now routinely reattached? This is a very rare injury, and I think that since 1979 there have been only about 15 subsequent cases in the world literature. Does anyone ask you, as a Christian, why you are doing corrective surgery; aren’t you ‘interfering with the way God made things’? Sure. But that applies to virtually all of medicine. Eating the correct diet and keeping fit will decrease your chance of disease, but some diseases happen that are not your fault, that are ‘unfair’. Go back 100 or 200 years: children were dying like flies from infectious diseases through no fault of theirs. That’s where a biblical perspective is important, because this world is not ‘fair’; it is not the way God made things in the beginning, but due to what happened after that. You mean the Fall, and the Curse on Creation when Adam rebelled? Yes. I believe there was a time when man was created perfect, not susceptible to these sorts of things. When you look into the chemistry and chromosomes, you find evidence of a complex design which is now marred. I believe this is because of what the Bible calls sin. So we’re looking at a fallen creation, which only makes sense when you take Genesis and a recent creation literally. That’s right. If there were millions of years of death and bloodshed before people appeared on the scene, what would be the point of fighting against all these bad things like disease? In that scheme of things, they would just have been part of what God called ‘very good’ [Gen. 1:31]. But how could God proclaim that disease and death were ‘very good’? That doesn’t make sense, especially when death is called the ‘last enemy’ [1 Cor. 15:26]. As a doctor, then, when you fight against disease, or reshape someone who is deformed as a result of an inherited mutation, you’re really fighting against the effects of that Genesis Curse. Yes, we’re fighting a rearguard action in trying to repair the damage that is occurring. Christ didn’t just passively say, ‘Well, this is the way it is,’ but actively opposed the effects of the Curse in healing people. Are you in a sense following His example? That’s true. He was the Great Healer — the Bible indicates He probably spent more time healing than preaching. Has anyone referred to Christ’s reattachment2 of the ear that Peter cut off [John 18:10, Luke 22:49–51] in comparison to your work? Yes, but it’s an uncomfortable comparison. Christ did it with a touch, it took me seven hours. Are your unbelieving medical colleagues sometimes awed by the design in the human body? Yes, a lot of these so-called evolutionists are constantly using words like ‘wonderful’ and ‘design’. They are almost unconsciously having to accept that things look marvellously designed. The more you look, and the smaller you look, the more you find. The tiny, tiny things we get down to — the molecules in the cell — are miraculous, just unbelievable. As a medical student 30 years ago, we were told, ‘We don’t understand this, we don’t understand that … ’, and now that we’re understanding some of these things, they are astonishingly more complex than we ever thought. How does your belief in Genesis Creation affect your interaction with your colleagues? It’s difficult, working in a world which is almost entirely evolution-believing, but from time to time I can have discussions, and I pass on information which casts doubt on what they have been taught. 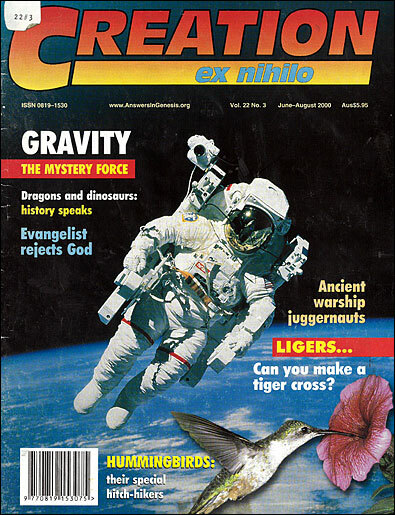 I find Creation magazines to be excellent for this and for teaching in church as well. We’ve published evidence3 exposing some bogus claims about finding e.g. Noah’s Ark, the Ark of the Covenant, etc. Please share the personal experience you’ve had concerning this. Yes, your magazine referred to these people, Ron Wyatt (now deceased) from Tennessee and his disciple (Jonathan Gray), saying they have discovered all these wonderful things that prove the Bible true — including also the Red Sea crossing, Christ’s actual blood, and so on. Now it would be marvellous if such claims were true, but if they are false it will come out, and the world will say, ‘These are the people who support the Bible and they’re telling lies.’ So it does the Bible no good at all; it is actually anti-Christian, if the results of their speculations cause people to doubt the Scripture. The Bible says we should ‘prove all things’ [1 Thessalonians 5:21]. When you look into the chemistry and chromosomes, you find evidence of a complex design which is now marred. Why do you think the claims are not true? First, because whenever the claims are held up to the cold, hard light of scientific day, they are found seriously wanting. Second, there’s sufficient evidence that they have not always told the truth. I have personal evidence of that. I attended one of Jonathan Gray’s meetings where he made various claims about the Ark of the Covenant, including the blood of Christ. He said, for instance, that the blood allegedly found on the mercy seat was unique in having no male chromosomal material, but showed complete ignorance of chromosomes by saying it had 22 ‘X’ chromosomes. This is absurd, and would be incompatible with life — males have one ‘X’, females have two. Did you tell him this? Yes, I wrote to him about this and other inconsistencies and errors, and he wrote back skipping about the issues and unsuccessfully trying to justify himself. I more or less left the matter, until, a couple of years later, I was told I featured in his book. He refers to a ‘Dr P.D.’ who, despite the reversed initials, is obviously me, as he actually quotes verbatim from my letter. He makes it appear that he comes out on top while having a face-to-face discussion with me, and describes ‘Dr P.D.’ as ‘sitting there seething’ and words to that effect. But it is a total fabrication — there was no such meeting or conversation. This is clearly deceptive, and indicates that the man deals lightly with the truth. I have other careful eyewitness reports of similar instances. Is there anything you would like to leave with readers? Both my sons are Christians and at university. They’re facing the continual attacks from evolutionists that Christians in the biological sphere face. The material from Creation Ministries International is incredibly helpful, especially the way it is based on starting from the Word of God. Because you can argue till the cows come home about the science, ultimately it boils down to evolution being a faith and Christianity a faith. Without a strong Christian faith, you’re not going to be able to stand against the evolutionary arguments. Dr Pennington, thanks very much. The superficial temporal artery and vein. Return to text. This miracle of instant healing may have involved the creation of a new ear; we are not told. Return to text. Snelling, A.A., Amazing ‘Ark’ Exposé, Creation 14(4):26–38, 1992; Has the Ark of the Covenant been found? Creation 21(2):10–14, 1999. Return to text.